My name is Corey Fergus. 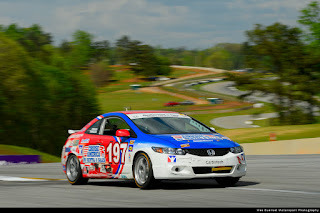 I race the #197 Honda Civic Si for RSR Motorsports in Grand-Am’s Continental Tire Sports Car Challenge with co-driver Owen Trinkler. The fourth race of the season for the Continental Tire Sports Car Challenge was held at Road Atlanta. Like when we traveled to Circuit of the Americas earlier in the season, we were very excited to be racing at Road Atlanta this year. I believe this was the first time Grand-Am has been to the track. If not for the merger between Grand-Am and the American Le Mans Series, we might never have gotten to race there. I was especially excited because I had already been there before. I’ve raced there in SCCA club racing, and have the unofficial track record in Sports 2000. I’ve also done hundreds of laps on iRacing so I was very familiar with the track entering the weekend. The team also came to Road Atlanta prepared. Back in November, when we found out Road Atlanta was on the schedule for 2013, the team went there to test the Honda Civic. We learned valuable information on the shocks and car setup in general. Our team was hoping to gain an advantage on our competition, something that is very hard to do in this series. It paid off in some respect because our #197 Honda Civic Si turned the fastest ST lap of the weekend at a 1:36.922. The test day was beautiful and we spent the entire day fine-tuning our setup. Road Atlanta is officially the bumpiest track we’ve been to in the Honda. It took us a while to get the shocks and springs dialed in where we wanted them to try to settle the car down. Still, being 6’4”, my head hit the ceiling several times each lap. It was definitely an entertaining ride around the track. Qualifying was canceled. Similar to what happened last year at Lime Rock, it rained for qualifying. Grand-Am has an unwritten rule, that if it rains for qualifying, we will not qualify. It’s a safety thing, they say. This meant that we had to start 10th based on championship points. It’s frustrating for me, because as the starting driver qualifying is your opportunity to get a good starting position, something that can impact your finishing position. Because we started 10th, it was hard to work my way up through the pack in the beginning of the race. By the time we pitted for the driver change, I was in 7th. Owen drove a smart race and brought it home in 5th. For the third race in a row, an RSR team car was the top finishing Honda Civic. After a solid points finish, we are now 8th in the championship, but instead of being down by 32 points, we are now only trailing by 17. We’re back in the championship hunt. With 7 races still left, a lot can happen and hopefully we can close the gap. Our next race is at Mid-Ohio, in Lexington, OH, June 15th.